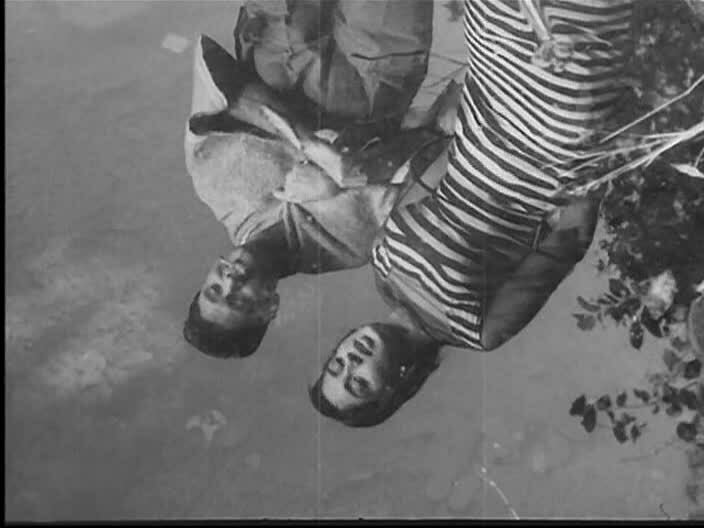 There are several interesting aspects of Nav Ketan Films' Hum Dono (recently colorized; I saw the original black and white), and if you can get past Dev Anand's secondary of two roles as Chortling English Accent Twit, you might really enjoy them. Me, I got distracted. Dev is not among my favorite actors anyway (though I have only seen Jewel Thief and Guide), and the things I normally find irritating about him— his ubiquitous and out-of-place pompadour, jaunty body movements that border on swagger, smug facial expressions, and slowed-down, growling delivery—were ratcheted up in his performance of Major Verma. Verma chomps a cigar, strokes his mustache, rambles on and on about personal details in odd ways, and tries very hard to sound old-school English. "Oh dash it!" he grumbles, lacking only a "Jolly good show!" from the Pip Pip and All That! Mining English Vocabulary Stereotypes for Comedy Gold handbook. 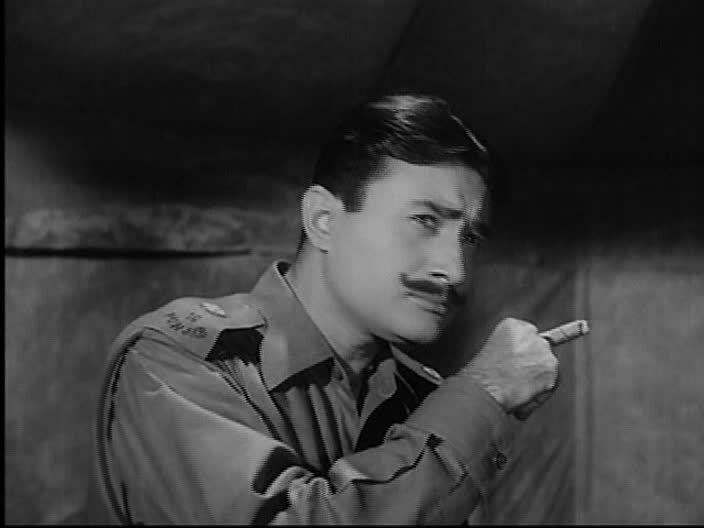 It's entirely possible that this character is a bit of a parody of 1950s war films or other contemporary portrayals of colonial authority figures (and Indians who tried to be like them, a sort of updated Massey Sahib); lacking those references, though, I just wanted to poke my eyes out with a fork. (Hear a bit of Major Verma at about 3:15 here.) By contrast, though, Dev's principal character, Major Anand, who is the real focus of the story, is much more sympathetic...and normal, even. I was also not enamored of any of the female characters. This being a story set in wartime, you can bet your khaki there are mothers to deal with. They are as desperate and crazy as their daughters-in-law are depressed. Leela Chitnis as Anand's mother, already in full-on crazy mode just one day after he left to join the army.In the younger generation, we have Sadhana as Anand's fiancee Mita and Nanda as Verma's wife Ruma. They look pretty, but they mostly mope around confused and wide-eyed at the pain around them. I don't know why, but I think Nanda looks so much better here than she does in the western/modern clothes and hair we see her in in Jab Jab Phool Khile. 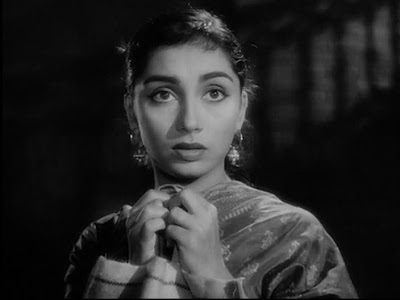 Ruma has all the personality of a wet mop, as the Bollywhat discussion of this film says, and Mita only occasionally shows more oomph or agency. 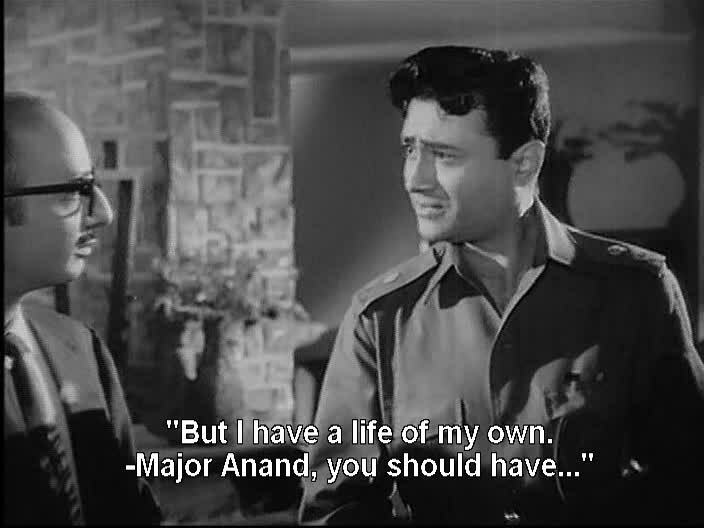 I did really like an exchange between her and Anand when he has just come back from the war but is behaving mysteriously. "I waited for you the entire year but not as much as I waited for you last night. I know you are tired and worried, but this silence is not the solution," she says, not quite pleading but quietly emotional, as he worries his forehead and sinks into a bed. She eventually softens and takes pity on him as a song from earlier in the film replays: "if you hide from me, then whom will you tell?" Unfortunately for her, he is hiding something very important and she is absolutely right to have a funny feeling about his absences and strange behavior. 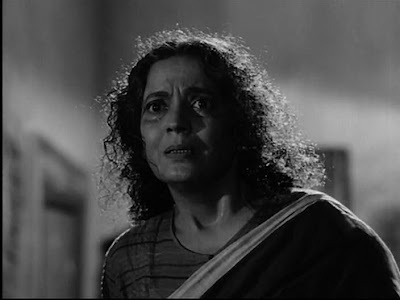 The movie didn't seem to address Mita's (or Ruma's) legitimate sadness and anger in its resolution. 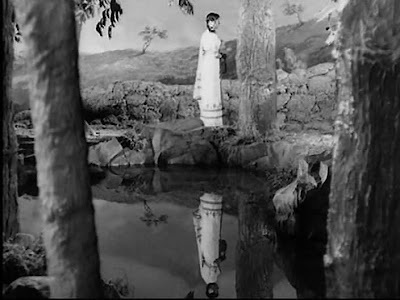 Overdone Dev and watery women aside, Hum Dono has some real loveliness. 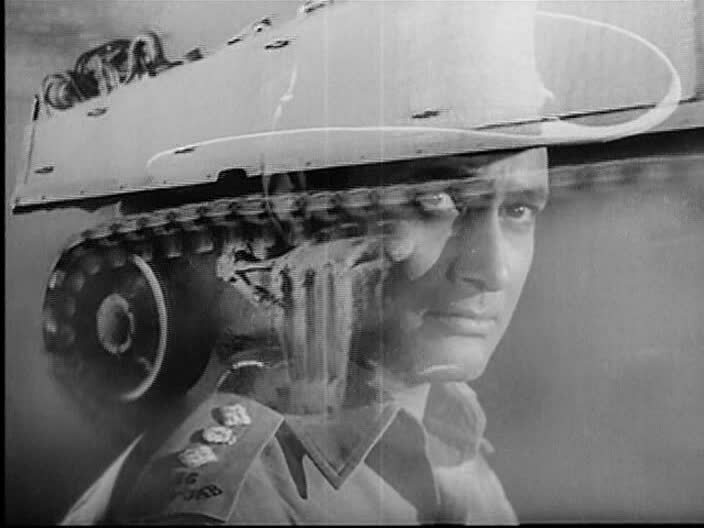 With Vijay Anand involved*, you can count on pretty visuals with rich content in both images and ideas. I particularly liked the use of reflections in water. Sometimes the person gazing at the water sees what he wants to see and at others what is really there; to me this was a nuanced way of demonstrating that you get out of life what you put into it, a lesson that both Verma and Anand learn the hard way over the course of the film. 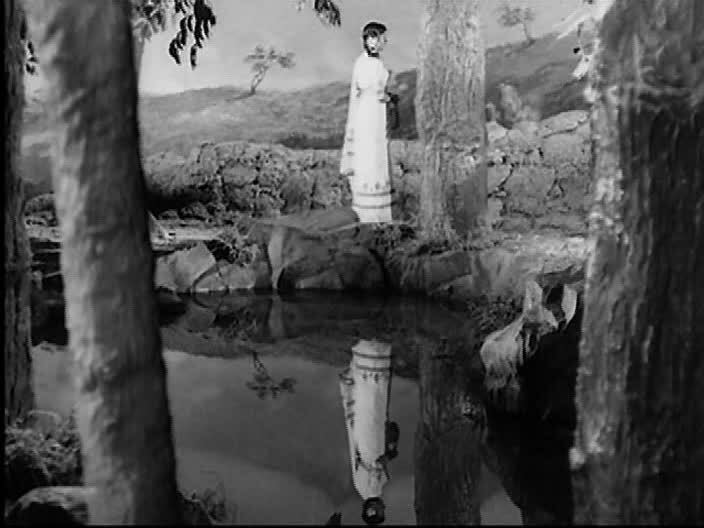 Reflections also play up the lookalike plot device, which I think is used fairly subtly to discuss choices, priorities, and principles rather than as a more blatant "the good and evil faces of the same person" setup. Stating your needs is important, but it's even better to think ahead and consider the other people in your life as you make decisions (and to me it seemed that the major characters had clear and particular choices, even while there is also talk about fate and responsibilities). As a panicking Anand realizes he's made a big mistake, someone sternly chastises him: "You should have thought of that earlier." And it's true, he should have. 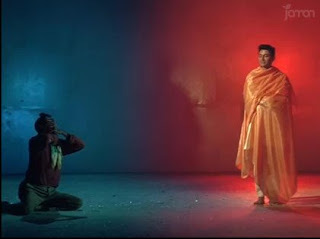 Anand is neither a sheep nor an idiot, but he also goes with his gut, which, in the crucial instance upon which the second half of the film hinges, is loving but unwise. In a sleep-deprived hallucination, the lookalikes debate how to deal with the mess they've gotten themselves into. This reminded me so much of Dev's conversation with himself in Guide! To my surprise, society's perception of their respective partners' purity was included. At first I was a little put off, thinking "Good lord, how'd we get to that?" (because of course nothing untoward had happened in either couple), but then I realized that way to highlight the effect of the men's plans, as are Ruma's physical health and Mita's domestic worries. Just like the water in the title sequence, ripples have fanned out from one small drop on the surface, and what people think they see is not always accurate. There are many well-done small moments too. Look at this training montage. 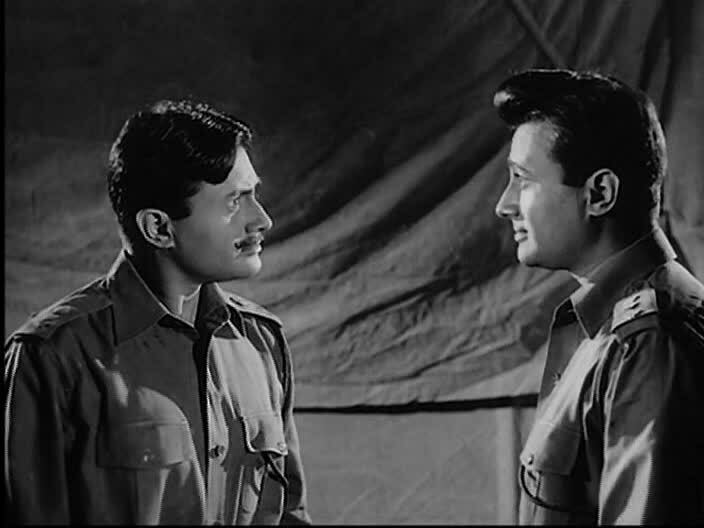 Anand enters the army a little lost and probably wistful for home, having signed himself up in a rash attempt to become enough of a breadwinner to ensure Mita's father's approval. With more experience (and perhaps a promotion, judging by his new hat? 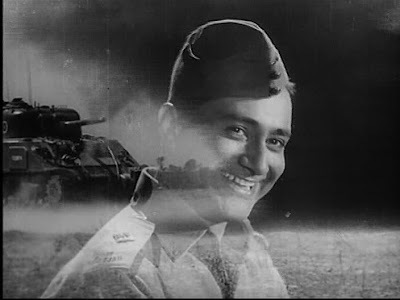 ), he's happy, but as time passes and the reality of war sets in, the smile has faded. 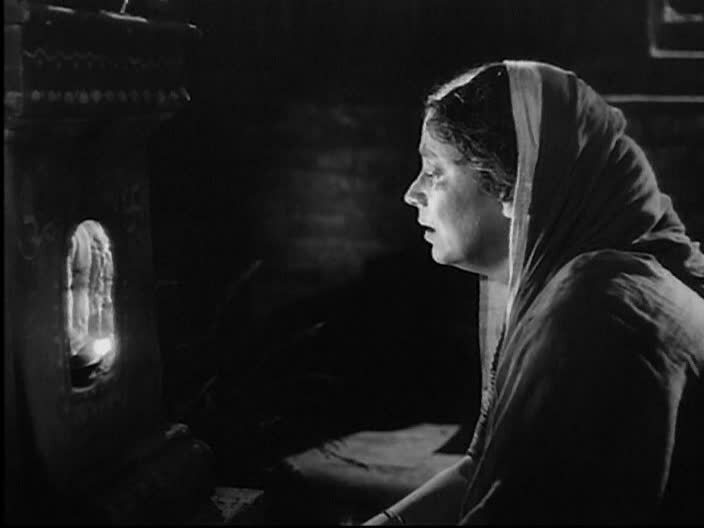 Even the light on a worried mother's face from her diya is beautiful, so simple yet so evocative of what this character craves. though the phrase stuck in my head after the film was the tune from Anand's musical lighter that occurs throughout, a concise badge of the reliability and constancy of Anand and Mita's love. I can't decide if Hum Dono just doesn't work for me or if I'm really missing something important in it (like dialogues that just aren't magical in English). As always, a Vijay Anand film makes me want to see and think about more Vijay Anand films, and a Dev Anand film makes me wish he would perform like an actor rather than a star. 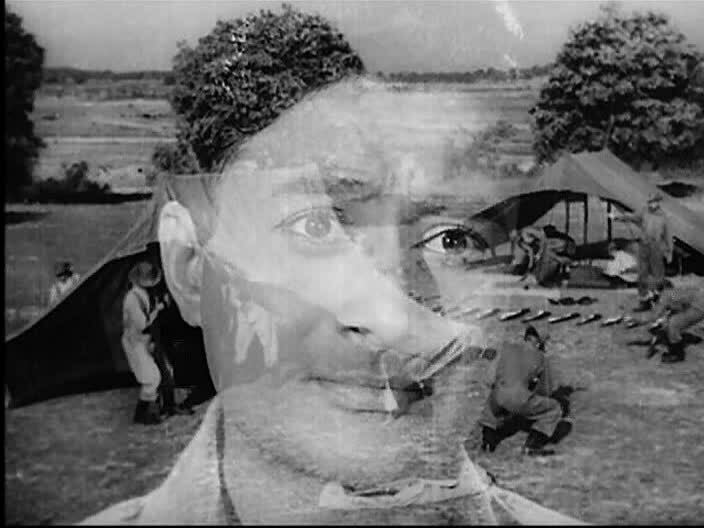 If anyone has recommendations of films in which Dev gets over himself and really becomes the character the film needs, I would love to try them out. And for fun, here are two things that made me giggle. 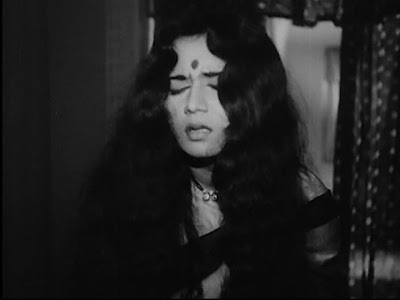 As stated earlier, I am easily irritated by Dev's very artificial yet often completely inappropriate hairstyle (why not spend all that hairspray on something suited to the film you're actually in? ), so when Ruma smooths it down while wondering why it looks the way it does, I shouted "You tell 'im!" to the screen. And not only is there knitting, the second male lead joins in! 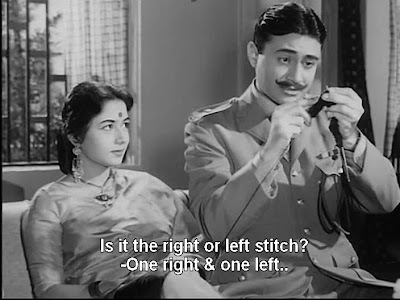 For more filmi knitting, be sure to look at Totally Filmi's tumblr of Rishi's sweaters. * I've been told he is the actual director of this film, even though it is credited to a Nav Ketan associate named Amarjeet. "I just wanted to poke my eyes out with a fork"
haha - this is almost my reflex reaction to Dev appearing on screen! With a knitting reference, now I have to watch it (I collect them, perhaps not surprising given my day job). 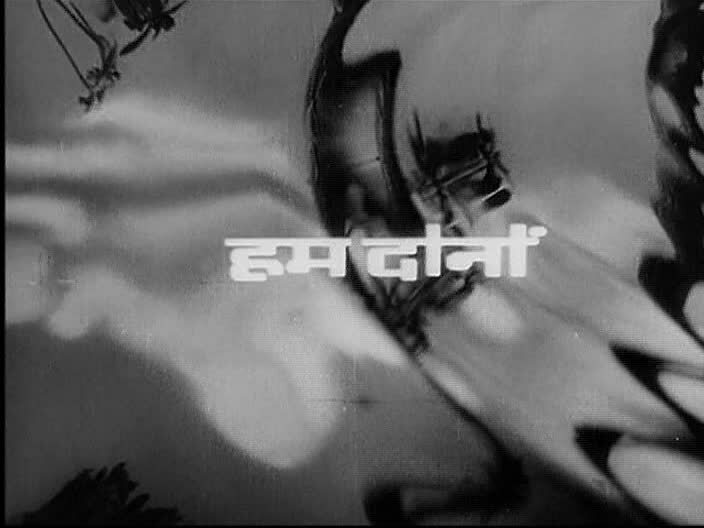 So far, though, I'm not really feeling too compelled to watch more Dev Anand. katherine - If I had not already sent this back to netflix, I would try to clip the brief knitting scene for you! This is most definitely not a bad film but I would have liked it much more - and thought it was more successful - if someone would have sat on Dev and made him do the roles consistently, not his own shtick. Beth, I keep coming back to your blog because your views are so refreshingly real and brood-worthy. 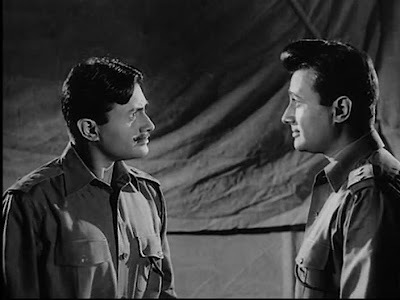 About Dev Anand, he was always thought to be the least talented of the leading stars at that time -others being Raj Kapoor, Dilip Kumar, Sunil Dutt. (hopefully I am getting the years correct in grouping them together). 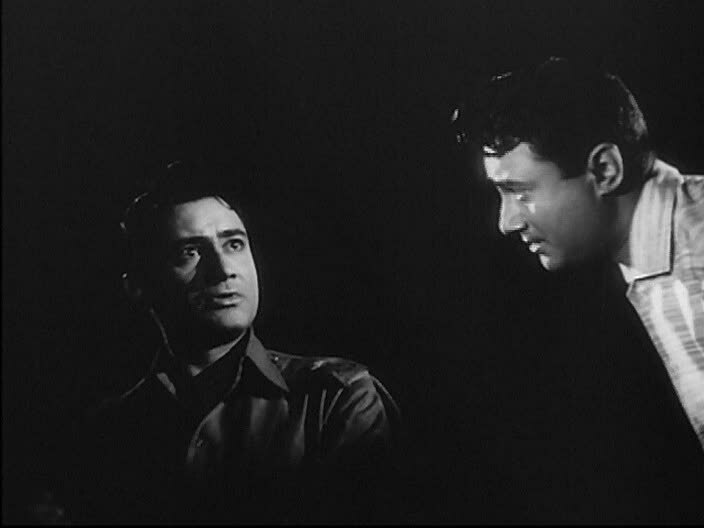 He had a female fan following during his time, especially when he was younger during the black-and-white era, and it was a lot because of his looks and the breezy romantic roles that he played - have you seen 'Paying Guest' or 'Solva Saal' or 'Tere Ghar ke Saamne'? So, I would suggest not looking at intense movies or movies that need acting when it comes to Dev Anand. He is (and I know you would vehemently disagree given that you are a SRK fan)pretty much like the SRK of 15 years back who was 'specializing' in those breezy romantic movies and worked them through sheer charm. For me, both of them needed the "indulgence" usually given to charming, good-looking, ultimately-good-person-at-the-end heroes. Hi Beth, great to see you mention the highly talented but rather unsuccessful Jaidev by his full name! 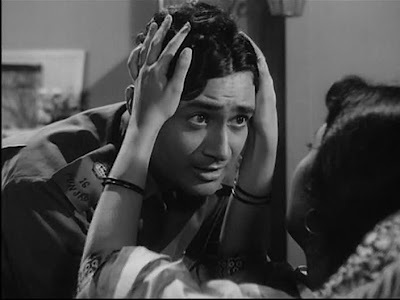 And you're right about Dev Anand, he's very difficult to watch without the fork in the eye. I've watched a lot of him because he did feature in the most sublime songs. It helps if you watch him through tightly closed eyes. The girls were crazy about him, though, and he was called India's Gregory Peck! Lovely blog, always a pleasure to read. Aparna - Thank you so much! I've heard this about Dev, and no, I have not seen those films you mention (only Guide and Jewel Thief). Thinking through and discussing Hum Dono has made me want to learn more about him, so I plan to watch some more of his films soon. Your SRK comparison makes me giggle because I do not like the SRK of 15 years ago nearly as much as I like his more recent work! I'm not a fan of DDLJ or Dil to Pagal Hai (though I do love KKHH, even though I can see its flaws plain as day). ara - The songs in this were great! I would definitely seek out more of the composer's work. Maybe Dev is like Haggis. If you'v grown up on him and his movies (the ones he starred in when in his prime), you'll continue to find him appetizing (like I do). Else it's quite easy to find him annoying and in his later movies, creepy. Great post! I love this movie because I like all the leads, and loved the music, styling and the rest.